"It looks so fake," one of the scientists giggles as the camera gets closer to the mysterious creature. "Like some little kid dropped their toy." 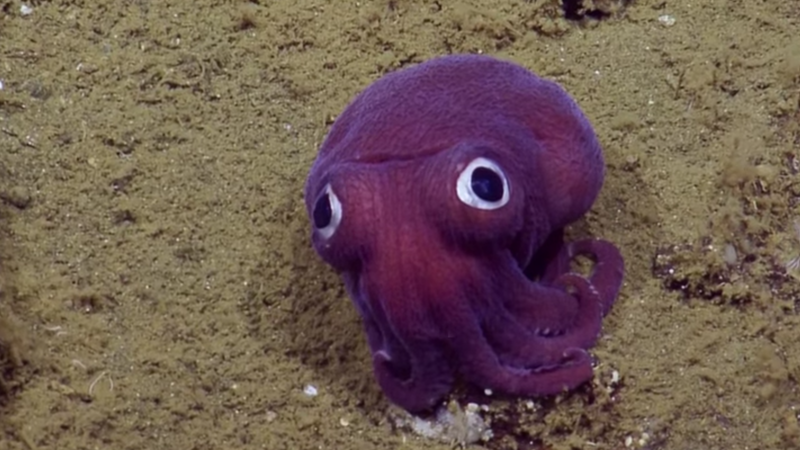 The team later discovered that this is, in fact, a special creature called Rossia pacifica, or stubby squid. According to the caption of the YouTube video, although the creature might look like a cross between an octopus and a squid, it's actually more closely related to the cuttlefish. "This species spends life on the seafloor, activating a sticky mucus jacket and burrowing into the sediment to camouflage, leaving their eyes poking out to spot prey like shrimp and small fish," writes E/V Nautilus.